If you haven’t been following geek culture for long, you might only know Terry Gilliam as the director of films like 12 Monkeys and The Imaginarium of Doctor Parnassus. But long before that, he was making crazy animations for a little outfit known as Monty Python. His distinctive animation style inspired a whole generation of fans to express themselves through weird little cutouts, funny voices and inane cartoon violence. Below is a video from 1974 in which Gilliam gives easy-to-follow instructions for making your own cutout animations at home. The clip shows Gilliam on the UK Do-it-Yourself Animation Show, hosted by the also-legendary Bob Godfrey. 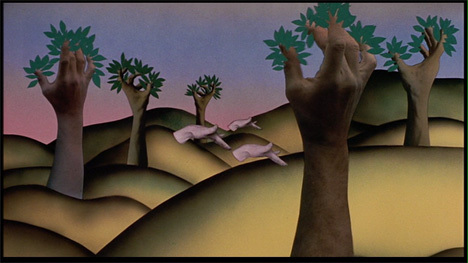 In the segment, Gilliam details his animation technique and gives viewers a wealth of inspiration for developing their own cutout animations. Some of the best advice in the clip is when Terry Gilliam tells a generation of future animators that animation is all about telling a story or sharing an idea, and the medium used to do that doesn’t matter. The message might be almost 40 years old, but it still stands true to this day. See more in Vintage Videos or under Vintage & Retro. September, 2011.